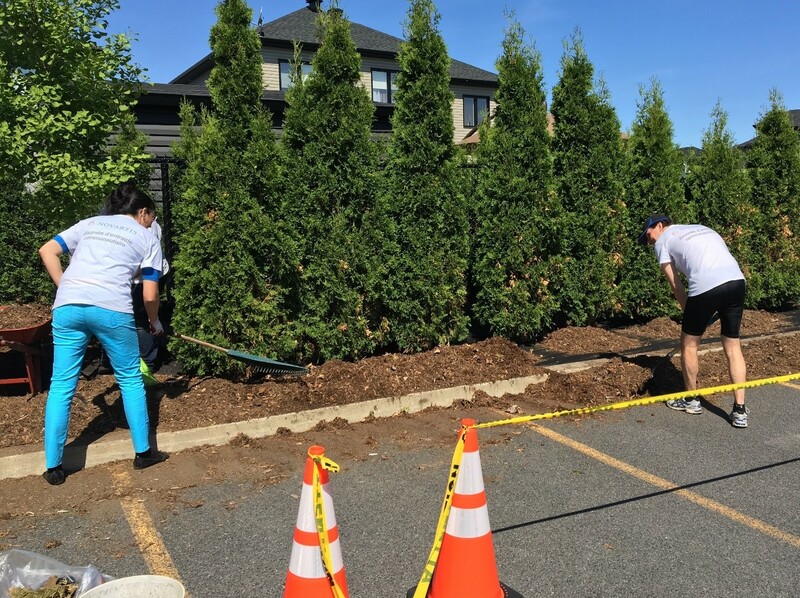 On May 11th, more than 50 Sandoz Canada employees took part in volunteering efforts to assist various local charity organizations in the greater Montreal area. 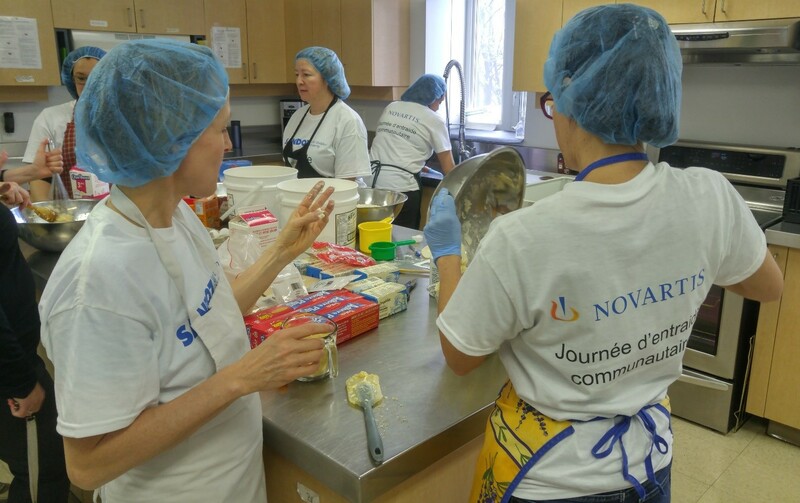 This was Sandoz Canada’s fourth year participating in Community Partnership Day, an initiative that was launched over two decades ago by our parent organization, Novartis. Since then, about 200,000 hours have been dedicated by employees to causes in their communities. Click here to find out more about our global community partnership efforts. Employees spent the better part of the day cleaning, painting and cooking at four different charity organizations, each holding a unique purpose and role in the community, including Complexe Le Partage in La Prairie, Centre de Répit-Dépannage aux Quatre Poches in Boucherville, L’Antre-Temps in Longueuil, and Oxfam Québec for their Marche Monde 2018 in downtown Montreal. The Human Resources and Communications teams helped out at Complexe Le Partage, an organization on Montreal’s South Shore offering low income families in the Kateri sector with support and assistance as well as training and integration services in the context of social solidarity and individual and collective care. The Complexe carries out its mission by providing food aid, community kitchens, cooking workshops, a soon-to-come community garden, and offers a free daycare for parents with very few options. Frédéric Côté, Interim Director of Operations at Complexe Le Partage says this kind of support means more than we may think. “The involvement of local businesses like Sandoz is crucial and extremely appreciated. It allows us to respond to the growing needs of the population, and without the help of Sandoz year after year, we wouldn’t be able to offer assistance in such large quantities,” he said. At Centre de Répit-Dépannage aux Quatre Poches in Boucherville, members of the Business Development & Portfolio and Innovations and Strategic Projects teams got their hands dirty cleaning the building’s exterior and interior in order to help prepare the centre for an important fundraiser dinner. Centre de Répit-Dépannage aux Quatre Poches is an organization offering temporary care to adults and children above the age of three with mental disabilities and autism, giving much-needed rest time to the sometimes-overwhelmed parents of these adults and children. “Initiatives like these are different than simple monetary contributions. Actually witnessing first hand the organizations in your community that need help, and then being able to make a difference directly is extremely rewarding,” said Rabih. Finally, our Finance team cleaned and did exterior work at L’Antre-Temps in Longueuil, an organization that hosts homeless and nearly-homeless kids between the ages of 16 and 21. On average, the organization helps about 150 young people per year. In total, nearly 250 Sandoz employees will take part in their own Community Partnership Day throughout the year. Additional organizations that will receive the help of our employees in the coming weeks and months include Moisson Rive-Sud and the Fondation de la Maison de soins palliatifs Source Bleue, both in Boucherville. One of our objectives at Sandoz is to give back to society more than we take, and by coming together and unleashing the full potential of our people, Community Partnership Day gives us the opportunity to do just that.